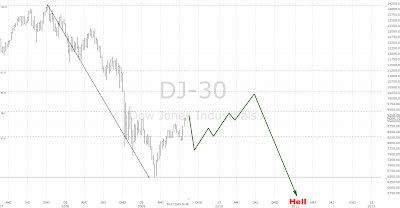 Last Friday, when I was reading the new post on Slope of Hope, I suddenly realized that the pattern from the stock market crash in 1929 corresponds exactly with the current bear market (and its rally). I find this correlation amazing! 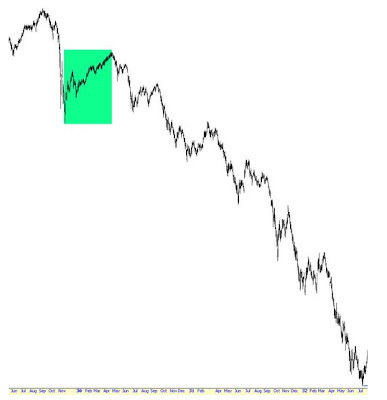 In 1929 we got a very sharp rally towards the 38% retracement level. After that was reached early December the market turned south again till Christmas before it rallied for another four months to reach the 50% retracement level. Comparing today's chart with the chart from 1929 I think we are in early December before the first big correction took place. We got a nice and sharp rally and nearly reached the 38% level. Thus I think we should see quite a strong correction over the next four weeks to about 820-850 and therefore trap all the bears that will have opened their short positions after the market plunged through 870. 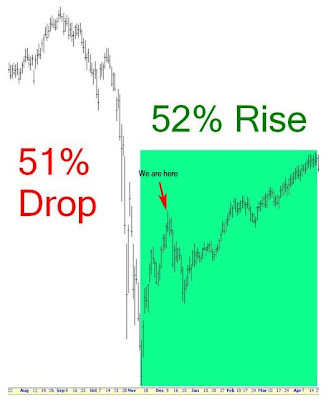 What should follow afterwards is a second rally to the 50% level over the next months to trap all the bulls that will be sreaming: "New Bull Market".